The Pearl River Tower epitomizes the super tall corporate headquarters building of tomorrow as an iconic, high performance structure, that is designed so that it potentially produces as much energy as it consumes. The building’s form guides wind to a pair of openings at its mechanical floors. The winds drive turbines that generate energy for the building’s heating, ventilation and air conditioning systems. The openings also provide structural relief, by allowing wind to pass through the building instead of pressing against it. 1) By orienting the building towards the east the tower takes advantage of midday sun while the effects of late-day sun on the larger, southern exposure are minimized. 2) The south facade’s low-E-glass, double-layer curtain-wall system reduces heat gain, which leads to less demand on the HVAC systems. 3) The tower reclaims energy by routing each floor’s exhaust air into the south side’s double-layer curtain-wall cavity. This thermal barrier of hot dry air can then be reused on the mechanical floor for passive dehumidification. 4) The chilled slab concrete vaulted ceilings in the typical offices enhance daylighting, as well as cool the air drifting up from the underfloor ventilation system, the mass of the concrete providing energy storage. This system reduces energy used for cooling by 40 percent compared to a conventional HVAC system. 5) A geothermal heat sink is used to provide cooling water, so 100 degrees Fahrenheit water in the mechanical system’s return loop can be cooled to 75 degrees Fahrenheit prior to feeding the cooling towers, reducing the size of the mechanical plant by about 30 percent. These five strategies reduce the building’s energy use by nearly 65 percent over a baseline of Chinese building codes. To reach the final goal of net zero energy, the design team incorporated three power-generating technologies: wind, integrated photovoltaics, and microturbines. The wind turbines take advantage of the prevailing winds from the south, which generate a negative pressure at the north side, of the building. 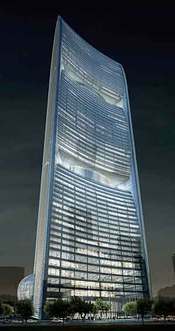 The tower’s curvilinear structure helps to force air through four turbine inlets in the facade, which SOM’s wind studies have predicted will speed up the wind’s velocity two-and-a-half times. SOM estimates the turbines will produce nearly 15 times more electricity than a typical stand-alone wind generator. No details are provided for the size or location of the photovoltaics, except that they are on the south facade. I assume the the microturbines are use to supplement power when the renewables do not generate enough power. SOM's commitment to design quality coupled with it's sophistication in building technology applications has resulted in a portfolio that features some of the most important architectural accomplishments of this century. Lever House in New York City, Sears Tower in Chicago, John Hancock Tower in Chicago to name just a few. Currently, the firm is designing landmarks for the next generation, such as the Freedom Tower in New York City, and Burj Dubai which will be the world's tallest building when it is completed, as well as numerous other projects around the globe. SOM’s work ranges from the design and engineering of individual buildings to the master planning and design of entire communities. The Firm has conceived, designed and built projects that include corporate office; banking and financial institutions; government buildings; public and private institutions; health care facilities; religious buildings; airports; commercial and retail facilities; recreational and sports facilities; university buildings; and residential developments. SOM’s offices are in Chicago, Los Angeles, New York, San Francisco, Washington DC, London, Hong Kong and Shanghai. Freedom Tower, site of World Trade Center, NYC, 2006 to 2011. Burji Dubai, tallest building in the world, 2625 feet / 800 meters, Dubai, United Arab Emirates, 2004 to 2008. New International Terminal, San Francisco, California, completed 2001. Enerplex, North Building, Princeton, New Jersey, 1982. First Wisconsin Plaza, Madison, Wisconsin, 1974. John Hancock Center, Chicago, Illinois, 1970. Wells College Library, Aurora, New York, 1968. Air Force Academy Chapel, Colorado Springs, Colorado, 1956 to 1962. Designed by a NYC firm, I see. Too bad it didn't find a receptive audience closer to home. This is what the Freedom Tower should have been. "I assume the the microturbines are use to supplement power when the renewables do not generate enough power." I can't imagine that they would choose microturbines for standby power. Electricity from the grid will always be less expensive. Rather, I suspect that they have some heat requirements that can't always be met in more efficient ways, and chose to generate that heat it in a way that gave them some bonus electricity on the side. Yes, Guangzhou is tropical and HOT most of the year, and it does sometimes get cold enough to want need heat for both hot water and space heat in January, when the average high dips into the 60s. (http://www.travelchinaguide.com/climate/guangzhou.htm). "Designed by a NYC firm, I see"
Actually I think the Chicago office designed this building (according to an email I got from SOM after quoting some of the article above) . Imagine the mayhem when another developer tries to build on their south side -- blocking their wind. Buildings cast a wind shadow roughly twice as long as their height. They even cast wind shadows upwind. Maybe that's why it isn't happening in the U.S. Even if construction near such a skyscraper can be prevented, such restrictions would cause a steep decline in their property values, and the owners would undoubtedly seek redress. The microturbines ought to be powered by solid oxide fuel cells running off biogas from the waste from this building. That would eliminate the need for fossil fuel backup. Go for it SOM! I sure like their use of geothermal cooling! Excellent. I had a similar thought, but I can't imagine that the architects haven't planned for that. I mean, I know almost nothing about this sort of thing, and it occurred to *me*. It had to have occurred to them. "I can't imagine that they would choose microturbines for standby power. Electricity from the grid will always be less expensive." Careful. Even in the south, the grid is over-burdened and relatively unreliable; and, predominantly fuelled by nice, clean (!) coal. On the other hand: South and west China are rich in natural gas; and in fact an extremely large natural gas pipeline expansion is currently well underway. Using that natural gas to provide any needed or topping electrical power - instead of drawing on a sometimes overwhelmed, coal-fired grid during the worst possible demand times-- makes a lot of sense. What would make even more sense would be to feed that natural gas to a large high-temperature fuel cell (e.g,, from Siemens, or FuelCell Energy), with a microturbine on the exhaust end of the fuel cell both for increased efficiency (about 60%), plus, capturing the microturbines' exhaust for hot water heating. The size of this building might also justifiy an anerobic digester for human waste treatment; to pull out the 'natural' gas from it to also run the fuel cell/microturbine. Several companies in California and Japan (e.g, Gill's Onions, Kirin Brewery, Sierra Nevada brewery) use biowaste digesters to run their large fuel cells in this manner. Cool so biogas to fuel cell/turbine is a reality at these companies already? Any links. Very good news! What this goes to show is that the energy problems we see as so very large will get solved in ways we can't imagine now. The real "natural resource" on this planet is human creativity. In the structure of a peaceful society with legal systems that allow good ideas to become reality, we will see these solutions flourish. The real challenge of the future is not limited energy supplies, but the nuture and care of this delicate thing we call civilization that enables these solutions to come about. My bet is that there will be be very serious noise and vibration problems to deal with. I would like to know the details... how big the wind turbines are in diameter, how much power they can develop reletive to wind speed etc. A good idea to have the microturbines as a means of supplemental power. With the energy prices at such highs, its behoves us to become energy efficient. Interesting article....."This is an iconic, high-performance building that is designed in harmony with its environment,"
Great! it so very amazing you have a very good shot on your photos. Keep up the good work. Great Design. I`m not much of an architect, but it seems to me that this could be really sucessful. yup it seems successful. i would love to see it when this project will complete. include corporate office; banking and financial institutions; government buildings; public and private institutions; health care facilities; religious buildings; airports; commercial and retail facilities; recreational and sports facilities; university buildings; and residential developments. I think this skyscraper has been built by 2009. This is wonderful architectural design by SOM on zero energy. This one is a fantastic addition to skyscraper for the Chinese tobacco company. Great work! it so very amazing you have a very good shot on your photos. Keep up the good work,thanks for sharing the blog. What this goes to show is that the energy problems we see as so very large will get solved in ways we can't imagine now. The real "natural resource" on this planet is human creativity. It seems like people builds these skyscrapers for the sole purpose of topping the skyscraper before them. This is great that is energy efficient. So many things are going green now Laundry room equipment, washer machines, dryers, everything. As we move towards to future of a more energy efficient world we will see more companies like energy star start to influence how we manage our energy. I love this design, they were so creative. Everything is done for a purpose and everything fits. Buildings cast a wind shadow roughly twice as long as their height. They even cast wind shadows upwind. I agree --- There will be noise and vibration problems to deal with. i enjoyed reading your blog. It was very interesting and informative. Orientation, conservation, lighting efficiency, geothermal, energy reuse and energy storage techniques are used to enable the building to generate enough renewable power to meet its energy demands. The SOM Designs Zero Energy Chinese Skyscraper is really amazing to watch I think that the given pictures and the information is to tell peoples about its information that how it got made. Awesome information. Such a fascinating piece of architecture, and the facts are amazing. Keep up the awesome work! Mind boggling on so many levels how advanced this marvel is! I know that Pearl River Tower’s green features include a rainwater collection system which uses solar water to provide hot water for the building, because I admire of this handicraft. I have read your article and by the way I found you website on Bing and I think after I read some post on you website especially this one I have my own comment about what should I tell on the next meeting with my boy friend, maybe next week I will tell my friend about this one and get debate. Chinese always rock i love this building architecture work. After see these Energy Chinese Skyscraper I am remembering a interesting phase that fiction is about the suspension of disbelief; science is about the suspension of belief. The SOM Designs Zero Energy Chinese Skyscraper is some thing to watch for because the Design of this Skyscraper is an amazing Idea and to make it possible it is some thing which is not so easy. it really most amazing gadget.its good i am thank full to you Canvas Prints its amazing for this century.Hi, It is really nice, but could you tell me how should I use this code,thanks for this information. project to build our client’s customer base and increase revenues.